SATURDAYS: “CALLIGRAPHY, THE ART OF BEAUTIFUL HANDWRITING”, Jan 19-Feb 9, 10am-12pm, Gulf Coast Arts Alliance Gallery. $150.00 for the four- week class. Supplies needed include Higgins Calligraphy waterproof black ink, 2 ½ ounce and Speedball Calligraphy Set with nib holder and 6 nibs. Special accommodation for the left-handed. 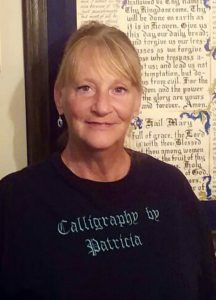 With over 35 years experience, Patricia Sheehan teaches the dip method (as scribes of old) of calligraphy. Sheehan teaches how to master the technique by lettering Chancery Italic on worksheets, envelopes and in poetry. As a bonus, each student will receive a CD Tutor at the conclusion of her class.